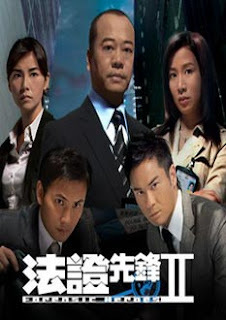 Look at the blog title and the poster at the side, hmm... some may think I want to blog a review on the famous Hong Kong series? Ha! Not really, though I quite like the series. 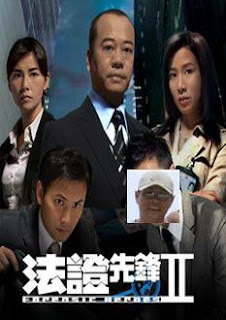 Just these 2 days I was working as a "forensic hero" to help my uncle to recover his lost photos that were inadvertently deleted when doing transfer between PC and the SD card. Well, how much it worth for the photos? What do you think if I say the photos were taken during his 8D7N trip back to China, or precisely our root kampung, Eng Chun 永春 with a group of extremely extended infinite far relatives, and he paid +/- RM10,000 for it? He could probably pay for second trip, but the group wouldn't be the same and there might not be any special worship ceremony to the ancestor anymore, plus he was being teased and laughed off by his friends on his silly mistake. I am always the free technical support to the family and branches, this time round I think it is a one-time golden business opportunity for me, I am definitely not over if I demand for RM5,000 to recover the photos right? And should have incentive or performance bonus if I manage to recover ALL, isn't this a perfect moment for me to gain some capital for my next baby, the iPhone 3G? LoL. While I was still deciding which to go, I browsed to my software folder for some housekeeping works. 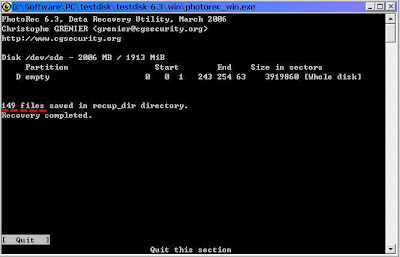 I was then greeted by a software called TestDisk. 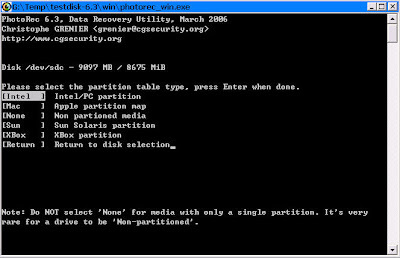 This simple software helped to recover my ~90GB of media files in a 100GB lost partition in my Archos. 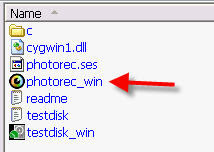 I unzipped it and navigated to the folders, I found an executable called PhotoRec_Win.exe. Ha! The name sounds very charming to me at this critical moment! :) Quickly I googled it and also visited the site at this page. Bingo! Its description describes exactly what I want! 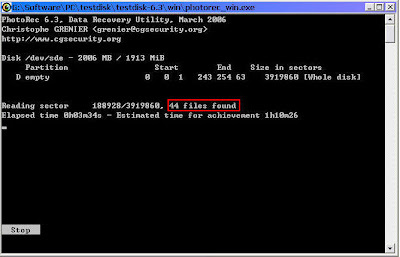 I was so excited about this and full confidence on this tool 'cause it (the TestDisk) recovered my data without a single loss, it has good comments in some photography forums as well! Further, some forumers shared the experience that it does not write anything onto the card, it reads bits by bits from the card and recovers the files onto your harddisk folder. Therefore, it's safe to give a try. Without further hesitate, I slotted in the card, double clicked the tool, carefully went through each question, hit Enter and my heart beat shot up to 5000 beats per second (each beat for a Ringgit). Haha! 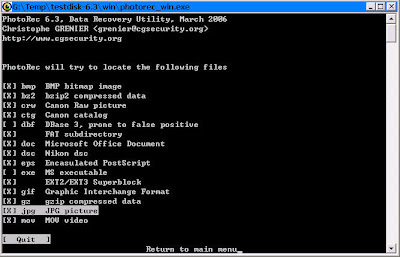 Back to serious matter, this tool (PhotoRec) and the other (TestDisk) have been proven (by me la) to be the savor when you need to recover files or disk partition respectively. Both are freeware, developed by CGSecurity, you don't have to buy those commercialware, I would rather suggest you to use the tool(s) and donate to the creator. 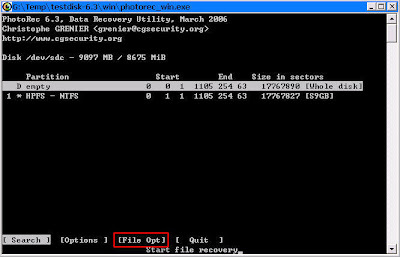 However, bear in mind, one very simple rule for the tool to work successfully is to STOP using the card (copy, paste, delete, format etc) immediately when you discovered data loss. 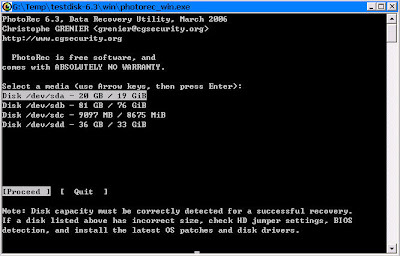 Otherwise, you may not be able to recover or fully recover your data. My uncle reacted well on his mistake that he instantly stopped using the card and kept it in the safe place (the housing). Below are some snapshots of the tool in sequence. If you notice, you can narrow down your recovery to certain file types in the 4th screen, which I believe it accelerates the recovery process depending on your selection. anyway, it was a good work. u r right, build ur repo, potential biz out there.